“Sub” came through big time for the James Buchanan baseball team on Thursday. Zach Monninger, nicknamed “Sub” because he has started occasionally throwing a submarine pitch, fired a no-hitter in a 4-0 Mid Penn Colonial Division victory over Big Spring. The Bulldogs managed only two baserunners - both on errors - and one of those was wiped out on a double play when shortstop Dylan Sanders caught a line drive and doubled the runner off base. “Everything was working today and I surprised them with the submarine pitch,” said Monninger, who said he threw the pitch around 12 times. Monninger, now 3-1, had used the submarine pitch as a freshman, but hurt his arm last year. “I had to throw from on top last year, and I just started being able to use it again this year,” he said. “I think every time he threw it today he got an out,” Sanchez said. The Rockets (7-8, 1-6 MPC) scored in the second when Dylan Sanders singled, was bunted up by Toby Sowers and scored on Kyle Buchanan’s hit. Sowers brought in a run in the fourth, and Remi Spoonhour had a sacrifice fly in the fifth. ONE GAME AWAY: After a sluggish start, Chambersburg broke open a Mid Penn Commonwealth Division game against Cedar Cliff. The Trojans had half of their 10 hits in a five-run fifth inning that allowed them to defeat the Colts, 8-1. 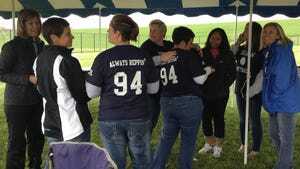 Chambersburg now just needs one more division win to clinch the Commonwealth crown. Chambersburg (15-1, 10-1 MPC) got doubles from Leah Hunt and Sam Bender in the fifth inning, and Hunt tacked on a bit of insurance with a solo home run - her seventh of the season - in the sixth frame. Cedar Cliff 3, Chambersburg 1: Another strong pitching performance wasn’t enough for Chambersburg to overcome Cedar Cliff in Mid Penn Commonwealth Division action. Kaden Hoover allowed five hits in five innings and gave up just two earned runs. For the second game in a row, Chambersburg (6-9, 4-7 MPC) had more hits than its opponent and could not come out on top. Manning Brookens drove in the Trojans’ only run with a double in the third inning, while Chance McClure also had a double for Chambersburg. Boiling Springs 7, Waynesboro 6: Zach Vonstein hit a walk-off single with the bases loaded to give Boiling Springs a Mid Penn Colonial Division victory over Waynesboro. The Indians (12-4, 5-3 MPC) gave themselves a chance despite trailing 5-4 headed into the top of the seventh. Francisco Maya hit a two-out double to set up Bubba Hamilton’s two-run home run, but Boiling Springs answered right back for the win. Cody Cline and Nick Irizarry each had a pair of knocks for Waynesboro. Southern Fulton 9, Fannett-Metal 6: Southern Fulton racked up five extra-base hits in an SHL/ICC victory over Fannett-Metal. Dylan Gordon went 3-for-4 for the Indians and was a home run away from hitting the cycle. Branden Lynch drove in four runs, and Zach Clark also had two hits. “Offensively, we have been switching the order to stimulate some life, and we finally are getting production like we should have been receiving all year,” SF coach Dustin Fischer said. McConnellsburg 13, Northern Bedford 7: After scoring 10 runs in the first three innings, McConnellsburg hung on for an SHL/ICC victory against Northern Bedford. Logan Little led the offensive charge for the Spartans (5-10, 5-8 SHL, 4-7 ICC) by going 3-for-5. Justin Welsh and Garrison Crouse each had a pair of hits, while Crouse and Quintin Miller drove in three runs apiece. Ryan Koontz had two RBIs. 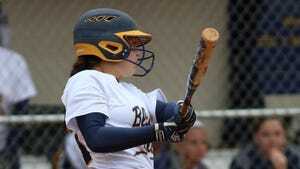 James Buchanan 2, Big Spring 1: Jenna Mongold and Taryn Miller cracked solo home runs in the third inning and Mongold made them stand up for a key MPC Colonial win for the Rockets. Mongold pitched a five-hitter with three strikeouts. JB (8-4, 3-4 MPC) managed only four hits off the Bulldogs’ Mackenzie Brymesser, but made them count. Waynesboro 8, Boiling Springs 3: The Maidens (10-6, 5-3 MPC) trailed 3-1 until they scored three runs in the third. Katie Wise was 3-for-3 and Hannah Wile was 2-for-with a walk, double and sacrifice fly. Lauren Hunsecker earned the win with five innings of scoreless relief. Fannett-Metal 15, Southern Fulton 4: Fannett-Metal scored a run in all but one inning and took down Southern Fulton in SHL/ICC action. The Tigers (9-7, 6-7 SHL, 6-6 ICC) racked up 14 hits, led by Mandy Swailes and Brooke Harris, who each had three. Emily Metcalfe, Makayla O’Donel and Morgan Ritchey finished with two hits a piece. Southern Fulton (3-13, 3-11 SHL, 3-9 ICC) was led by Lakyn Morton, who went 2-for-4 with two RBIs, and Maddie Baker, who had three hits. Northern Bedford 3, McConnellsburg 0: Northern Bedford came out on the right side of a pitchers’ duel against McConnellsburg in SHL/ICC action. The Spartans (4-12, 2-10 SHL, 2-9 ICC) managed only one hit off MacKenzie Eshelman, while the Panthers notched five hits off Carly Swope, who walked just one and struck out three. Swope was the only one with a hit for McConnellsburg. Southern Huntingdon 8, Forbes Road 2: Southern Huntingdon played a well-rounded game to take down Forbes Road in SHL/ICC action. The Cardinals (5-9, 4-8 SHL, 4-7 ICC) managed just five hits, two apiece from Malea Truax and Tina Parsons. Maddy Miller drove in both of Forbes Road’s runs. Greencastle-Antrim 124, Trinity 26: Campbell Parker was the lone double winner for Greencastle in a non-league victory over Trinity. Darius Carter was first in the 110 hurdles, followed by Chris Bowman, while the pair traded places in the 300 hurdles. The Blue Devils are now 6-0. Mercersburg wins IPSL: Mercersburg Academy easily won the Independent-Parochial School League title by racking up 186 points. The runner-up managed just 66. The Blue Storm swept a pair of events, taking first through third in both the 1,600 and the javelin. Gabriel Allgayer was the victor in both distance events. Greencastle-Antrim 102, Trinity 47: Jordan Pizzarro finally got her name in the Greencastle record books by breaking the school and the stadium record in the 200 with a time of 25.6 seconds. Greencastle (5-1) also got a victory from Pizzarro in the 100, while Madison Hurley (1600, 3200), Jenay Faulkner (discus, shot put) and Alexis Dougherty (triple, long jumps) were all double winners for the Blue Devils. Mercersburg takes 2nd at ISPL: Finley Stewart won a trio of events as Mercersburg Academy placed second in the IPSL Championships. Stewart won the 100, 200 and 400. Isiuwa Oghagbon won the shot put and the discus and placed second in the javelin. Cumberland Valley 3, Chambersburg 1: The Trojans had a rocky start, losing the first two sets 25-14, 25-14, then rebounded to capture the next set 25-21. But the Eagles ended the match with a 25-19 win in the fourth set. Dalton Strite had 10 kills and nine digs, Ian Patterson made 27 assists and had eight digs, Will Gerhart led in digs with 17, Evan Misal had eight kills and Riley Washington had seven for the Trojans (7-5, 7-3 MPC). Chambersburg 12, Mechanicsburg 7: Cameron Stouffer had scored only one goal this season until she netted four to help the Trojans (3-11, 2-8 MPC) snag a Mid Penn win over the Wildcats. Kendyl Stewart, Maggie Nichols and Hannah Raines scored two each and Liza Ernst and Jordyn Amsley both had one goal. 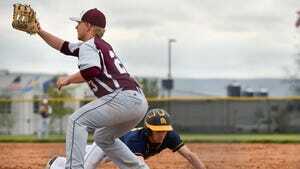 Mechanicsburg 18, Chambersburg 6: The Trojans’ losing skid reached nine games with a loss to the Wildcats. For the Trojans (1-14, 1-10 MPC), Cedric Adams scored two goals, Brandin Cosey, Haden Ocker, Riley Ocker and Jace Hopple each had one, and Hopple had an assist. Cumberland Valley Christian 1, Highland View 0: The Blazers received a forfeit win that moved their record to 3-5-1.